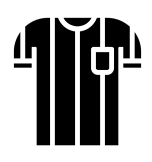 WSA Junior Referees are those kids who are WSA members, in 6th - 8th grade and seriously interested in becoming a State Certified Referee once age-eligible (turning 13 by June 30th of the following year). Certification is available by the state and encouraged; registration for that can be done at the Connecticut State Referee Program Website. New Junior Referees officiate only 2nd grade games; therefore the number of games is limited. Returning Junior Referees officiate Academy games (3rd/4th grade). The good news is these kids will have a firm understanding of the laws allowing them a better chance of passing the State Certification test with ease when the time comes. All Junior Referees are on the honor system as far as who is doing the review following the training. The one sure way for us to know if a child has done his work is how he/she functions on the field. A child will be asked to review the Modified LOTG (below) if he/she does not appear to understand the laws of the game. Much like any job, if a Junior Referee is unable to meet expectations, games will not be assigned. This is how it works once certified as well, so its a good idea for all Junior Referees to take knowing these laws very seriously.